Despite the many laptops we've reviewed over the years, we have never tried a machine that runs on Google's striped-down Chrome OS... until now. Testing a laptop that is both kid and business executive friendly, we check out the Dell Chromebook 11. One brand we're certainly no stranger to is Dell, and we've always found the quality of their computers and laptops to be top-notch. 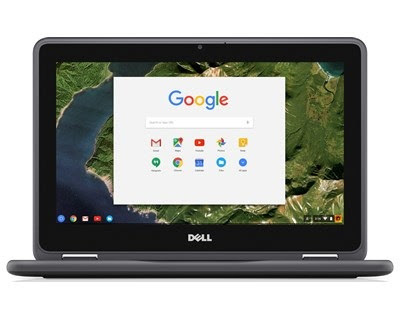 The Dell Chromebook 11 seems to be no exception, as it is solidly built laptop that looks like it could survive more than the occasional knock and bang. In fact, the design of this laptop's casing is intended for just that. 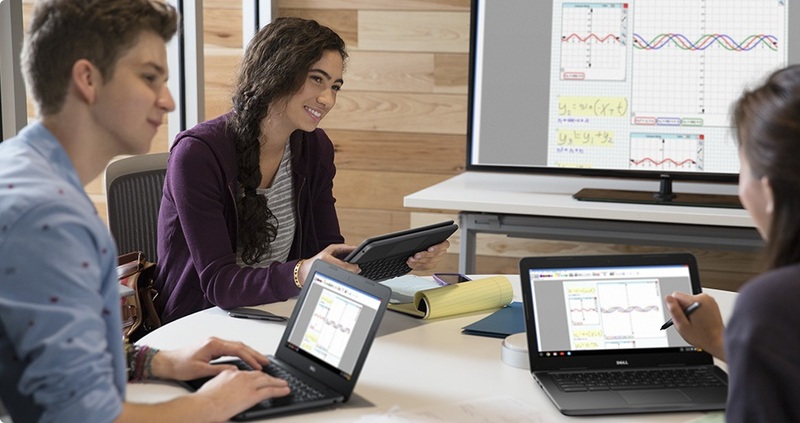 Dell are largely marketing this as an education 2-in-1 device, and the rubberised bumper than runs around the edge of the keyboard section confirms that. Also, as Chrome OS is far simpler to use than both Windows and Mac OS, it is easier for younger minds and smaller fingers to navigate. 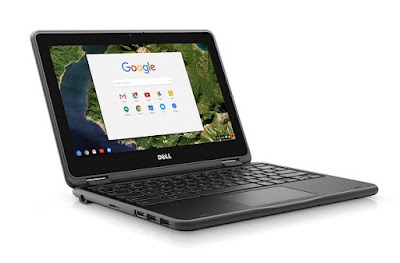 The Dell Chromebook 11 itself features – as you might have guessed – an 11.6 inch touch screen display set upon 360 degree hinges. This means the screen can be positioned at angle relative to the keyboard, so it can be flipped completely around to turn it into a tablet. However, as the keyboard section doesn't detach (unlike something like this) you're left with a pretty chunky tablet to handle. Still, in laptop mode (or indeed, laid out flat on a desk, or even propped up as an A) it works a treat, and the touch screen is very accurate and responsive. There are two USB ports along the side, as well as a MicroSD card slot and also an HDMI out. 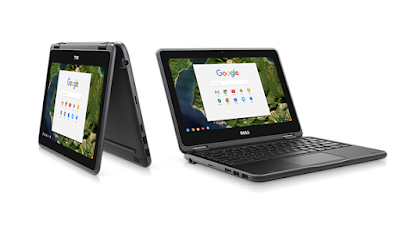 The Dell Chromebook 11 comes with 4GB of RAM to keep things ticking over smoothly, but only a 16GB eMMC hard drive. Yep, just 16GB. Being the first laptop we've ever seen with an eMMC drive, we weren't overly familiar with the concept. It essentially means that the storage is fully integrated into the workings of the laptop, and just like with a larger solid state drive, there are no moving parts to get damaged. eMMC storage is therefore nearly impervious to drops and knocks – again reiterating the 'for kids' stance that Dell is taking with this laptop. So yes, the lack of standard storage might bother some, but this is a Chromebook after all; something designed for light and mobile computing where a connection to the internet, and therefore cloud storage, is paramount. During the two weeks we had it to play around with, we never once saved anything to it bigger than a picture or two. If, however, we were taking it for work while travelling and wanted to stock up on media to watch, we'd simply use the MicroSD port or an external flash drive. At only 1.4kg the Dell Chromebook 11 is perfectly weighted for kids, while still being a suitably useful tool for adults. Chrome OS can seem a little limited at first, but once you get your head around what a Chromebook should be used for it is actually refreshing to use. 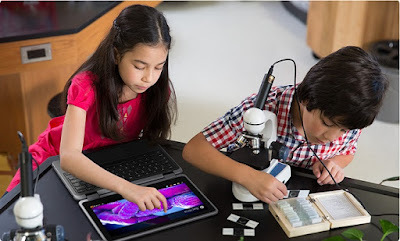 Dell are focussing on the education market with this, but if you are looking for a rugged notebook with the versatility of the 2-in-1 feature, this should be a definite contender.